The summer is not really finished here, especially when compared to the snow Coach Rob has seen in Calgary in the past week. But the sticky roads of Le Sud tell me that it’s at least harvest time. Another thing that told me that is an email from Anne a few weeks back, asking for help for their vendage, which I finally took part in this year. 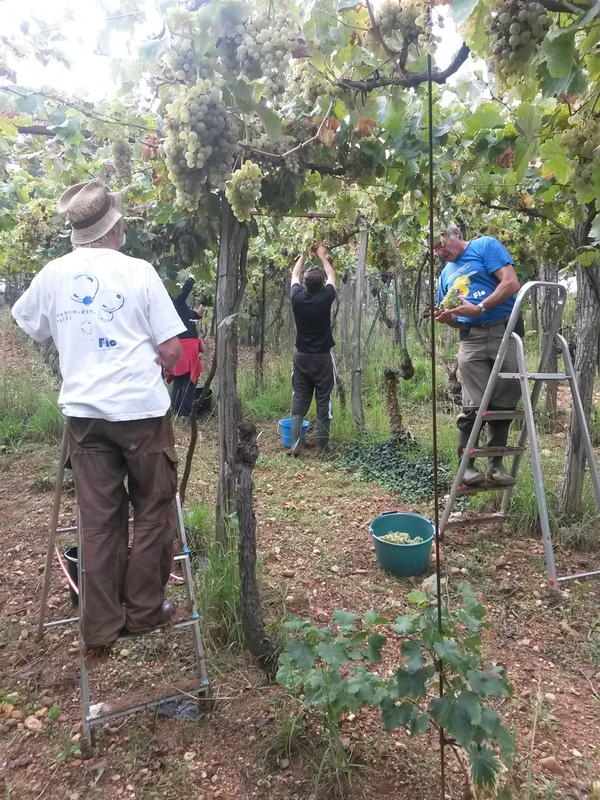 I helped a bit in the picking of ‘the little white grapes’, joining the crew like a seasoned pro…till I innocently asked Jacques if I should clip them close to the bunch or include the branches. His response: ‘we’re making wine, not salad’. I was found out pretty quickly. But it’s not rocket science and I think I held my own out there, while it lasted. Erik and Anne, however, were inside, so I joined them for most of the time to help squish the grapes. The press, Anne’s great grandfather’s, was pretty old but really ingenious, too. It did take some upper body strength, however, which cyclists normally lack. 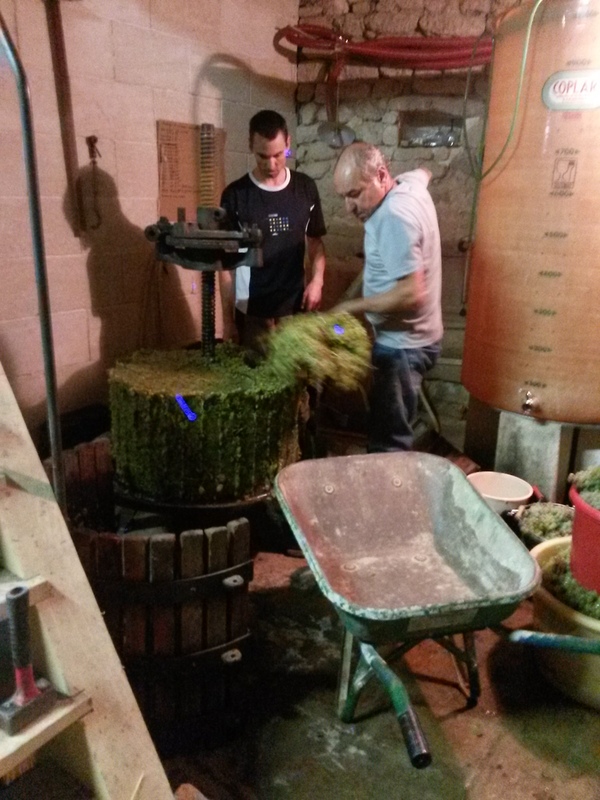 Christian, forking out the remains of the grapes after pressing. There were still plenty left unsquished, though, which dictated more traditional methods. 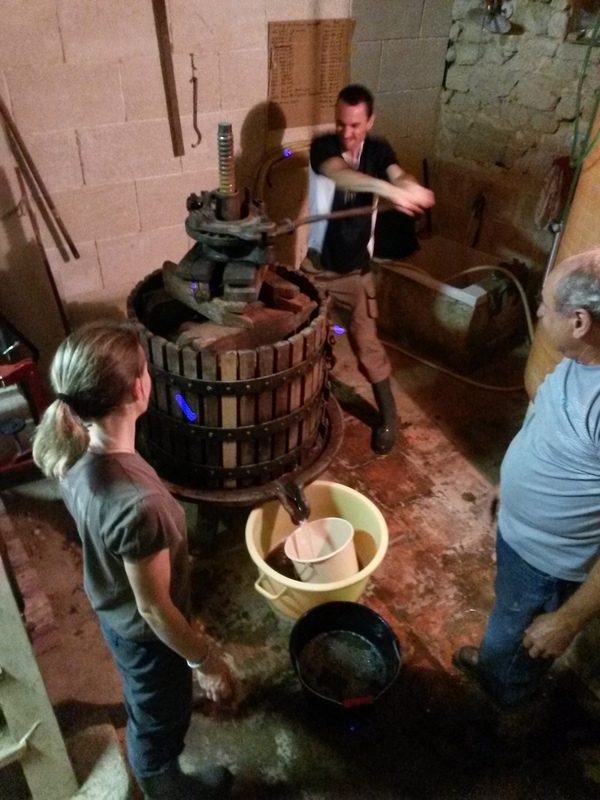 The stomping of the grapes is something only a few years ago I had thought only existed in Peter Mayle books. Here’s Anne, bursting that bubble. 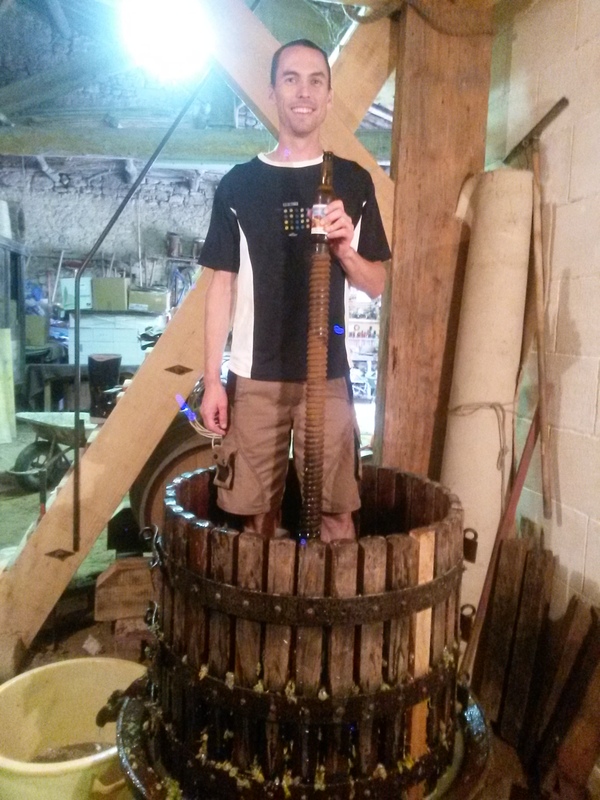 And Erik, taking an organic beer break between grape loads. 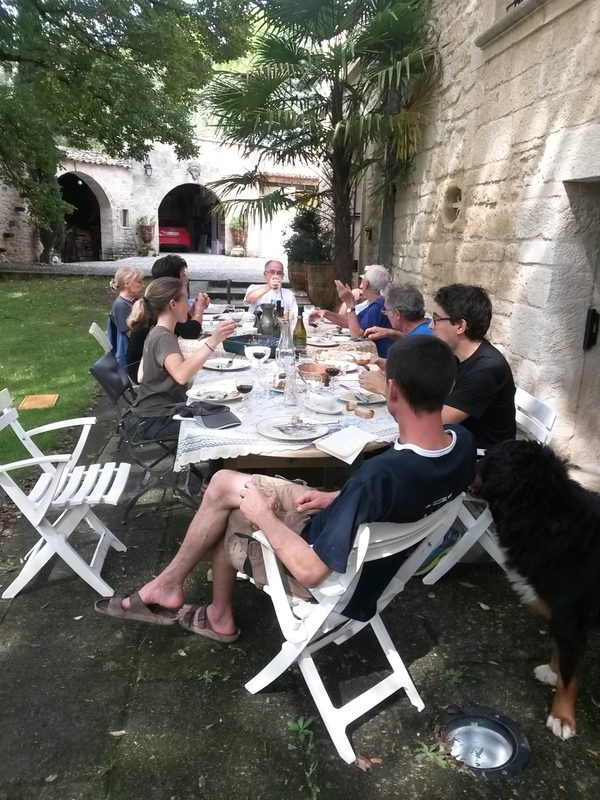 Everyone at this table is still out there working, but I had to excuse myself to come back home and blog about it. For my meager efforts I was rewarded with this wonderful lunch, a bunch of wine from previous vintages, and a decent upper body workout. Thank you for reading this little interlude. Back to the bike next post. NOW WE’RE TALKIN’! This is exactly the type of post I requested this summer! love this! 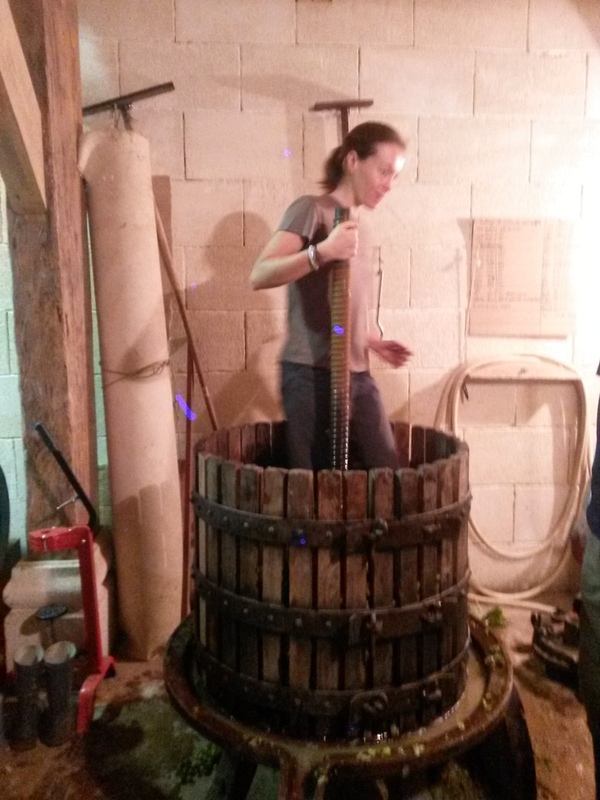 I have always wondered about the grape stomping thing…now I know. a votre santé! 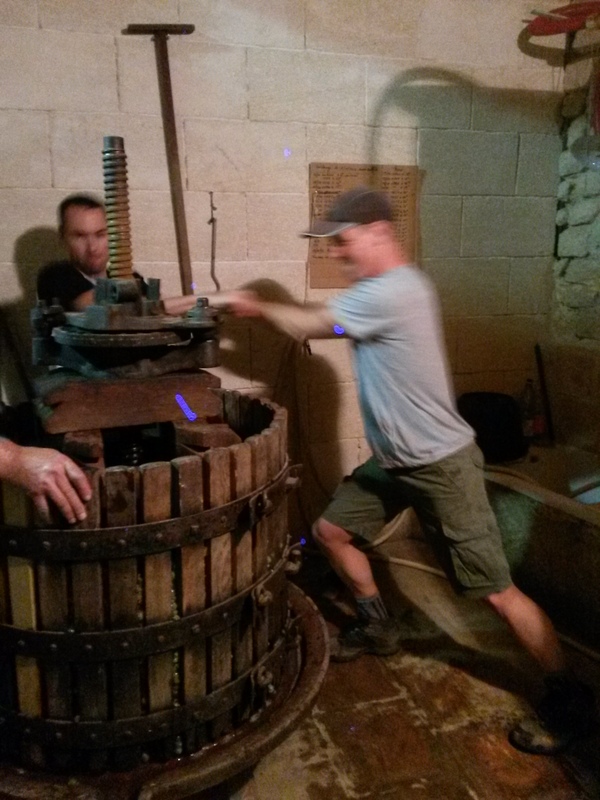 I’m not sure of the stomping ratio in wine making these days because the Nouvel’s definitely do things ‘old school’. It was fun to watch, though, I can tell you that! Really interesting grape trees! I’ve never seen them that tall before. Is that a special variety? I’ve always thought that would be fun to do. For a day. You’ll have to go back next year to taste the fruit of your labours. I don’t think it’s any particular variety because the red wine has 15 of them in it! Probably just the way they train the vines. Luc, Gerry – It’s actually an old-fashioned vine training technique called the Pergola system. Originally conceived to raise the vines shoots, leaves and fruit up off the ground in “colder” vineyard sites while exposing the leaves to more sunlight, but most importantly, to maximize food production as other crops were often grown underneath the vines. Pergolas are still used today in northern Italy, especially in the Trentino-Alto Adige and Veneto regions. In the Nouvel’s case, I don’t think they grow any other crops, but I do recall seeing lots of chickens enjoying the open space. “Free-range” I guess! Coq au vin peut-être? Thanks for that little tidbit of information. Now that you mention it, I recall walking through such a pergola vineyard in Japan when I went over there with my university judo team many years ago. Not seen one since. Luc, how’s the new steed treating you, btw? The Canyon Ultimate CF SLX 9.0 is definitely top notch. Would recommend it to anyone. It’s just a completely different ride. I was out today and before the ride I was asking myself if part of me had to love and justify the bike because I paid so much. But you just have to ride it. Fantastic on all levels. Completely different ride. Unfortunately the motor is still the same but hills now being taken in much higher (lower) gear. All inclusive weight 6.7 kg.